In our home, classrooms and church as a young girl, the statues and icons of Mother Mary were always displayed in eye catching places, and they were as plentiful as flowers in the Spring. I found these sculptures and paintings very comforting, because we were taught about the Divine Mothers great compassion and love, and each one seemed to depict this gentle warm mother figure quite well. Along with these daily reminders of this unseen motherly presence were the movies of the time, that always captured my attention, and deepened my faith in the miraculous. “The Song of Bernadette” and “The Miracle of Our Lady of Fatima” were stories that touched me and many children, since the Divine Mother chose the youth to make herself known. In Lourdes, France it was a young peasant girl, Bernadette, whose life was altered by the visions and miracles of Mary. Then again, three children in a field in Fatima, Portugal, Lucia, Francisco and Jacinta, were visited by this “emissary of love,” and entrusted with messages that were to be delivered to the world. Children of Fatima as seen in the movie of the time. Both of these movies enhanced my childlike wonder of this iconic woman. Although there was much said about suffering in these stories, Hollywood’s choice of tender voices for Mother Mary, and the angelic orchestra music chosen for each apparition and miracle, clouded the harsh moments. I absorbed and was mesmerized by the miraculous, which left me seeking and pondering the sacred, and the Divine Feminine from an early age. So, when the celebration of the Mother Mary in May took place in our church, I felt a true excitement and honor to participate in the procession and songs of this joyous event. It took weeks of practice on how to walk, and for Sister Raymond to perfect our singing of beloved May Day songs. With all that behind us the day would arrive, and all the girls were lined up in the school parking lot from the oldest to the youngest ~ a sea of pastel ruffled dresses. We waited patiently for our signal to slowly make our way to the church to crown The Blessed Virgin with a ring of flowers. It was May Day, and we were the young devotees to this saintly woman ~ mother of Jesus ~ mother to us all. The procession traveled at a meditative and sacred pace, and as we entered the church our voices blended with the power of the organ. In that moment my voice wanted to please the Divine Mother, and my soul opened to a deeper level of devotion. Was this how the angels felt? After the crowning and church ceremony, I had my own tradition to celebrate May Day. I left my fancy dress in my closet, and put on my play clothes. Mother Nature had a gift for me not far from home. So, still feeling the magic of miracles that the service stirred up in me, I headed to the peace and beauty of the woods near my home. Always the air was fresh with the growth of Spring, and the soil under the trees was rich in scent and deep color. The leaves that fell and covered the ground in Autumn, now nourished the treasure that I was headed for ~ not far away. The rays of the sun always played with the vibrant greens on the trees, and made my walk along the path seem mystical. Mother Nature never disappointed me, and soon I stood in the midst of a huge patch of delicate baby violets. Their brilliant color meshed with the varied colors of green under growth, and Mother Natures artwork once again took my breath away. Anxious to surrender to all around me, I would find a log to sit on, so that the woods could relay their story to my eyes, ears, nose and soul. The songs out there were the harmony of the breeze, the bees, the scampering critters, and the birds in the trees. In the spell of nature I would gently pick a huge handful of violets to place on my home May altar. 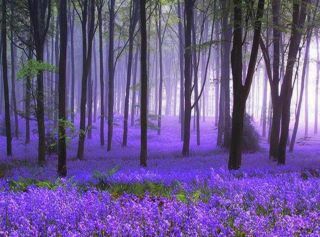 No matter how many I picked, the carpet of deep purple was so thick, that the gift given was never missed. In this fairyland of nature, I thought one day Mother Mary would sit amongst the flowers with me ~ a tender thought. With a handful of nature’s finest I would practically float home. In my bedroom my May altar was a simple one. Placed upon my mother’s finest doilies was a statue of Mother Mary, and in a few tiny glasses Mother Nature’s stunning gift of fresh picked violets. Although simple, it was a sacred place for me. As my sisters grew older we shared in the celebration of May, and for many years the violet patch provided us with a vision of splendor, and the perfect offering for the Blessed Mother. The movies and classroom stories told of Mary’s deep love and compassion, which seeded themselves in my tender young heart, and grew with time as chosen expressions. All my life I have found a comfort in the unseen presence of the Divine Mother, and have found the greatest place to make my connection to this “Mystical Mother” is in the presence of Mother Nature ~ my mothers of May. This entry was posted in Uncategorized and tagged anita skocz, divine mother, fatima, lourdes, mother nature. Bookmark the permalink.